Growth in the service sector backs off from red-hot spurts last year but remains strong. Based on 30-day federal funds futures prices at the moment, the market sees a 57% chance that the Fed will cut rates one notch or more by its December 11 meeting. The market sees no measurable chance of a rate hike. The Fed would generally cut rates because the economy gets in trouble. So let’s see. The services sector, accounting for about 70% of the US economy, has been backing off from the red-hot spurts experienced for brief periods in 2018 that had been similar to the red-hot growth spurts in 2015. In both 2015 and 2018, “real” GDP (adjusted for inflation) grew 2.9%, the fastest growth since the Great Recession. And the latest data shows that the economy is now reverting from the top of the range to the middle of the range. This was confirmed this morning by two reports about the services sector in March, the Non-Manufacturing ISM Report and the IHS Markit US Services PMI. Both are indices where a value above 50 indicates growth and a value below 50 indicates contraction in the services sector. The higher the value, the faster the growth. The ISM Non-Manufacturing Index, at 56.1, shows solid growth but has been backing off from the red-hot growth spurts in September, October, and November 2018, when index levels had exceeded 60. The index also exceeded 60 in October 2017, and in July 2015. So these 60+ readings are not very common. Now the ISM Non-manufacturing Index is back in its post-Financial Crisis normal range. 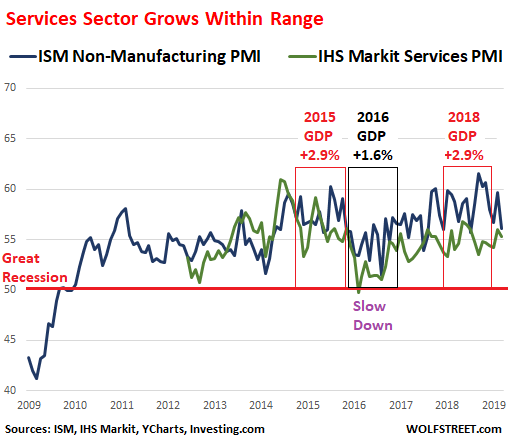 Both the ISM Non-Manufacturing PMI and the IHS Market Services PMI track the vast services economy in different ways and they don’t include all the same sectors. 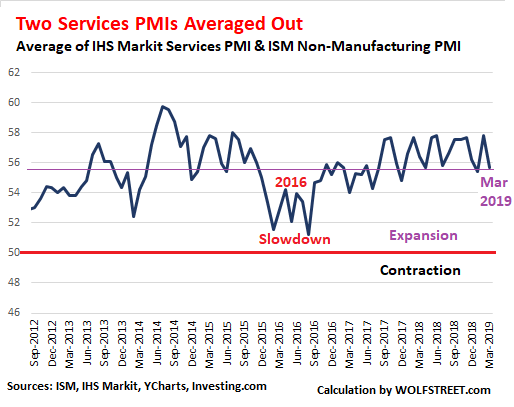 The IHS Markit PMI is narrower: It includes consumer services (except retail), transportation, information, communication, finance, insurance, real estate, and business services. The ISM PMI is broader: It includes retail; construction; professional, scientific & technical services; health care; educational services; accommodation & food services; public administration; mining; business services; agriculture, forestry, fishing & hunting; transportation & warehousing; real estate, rental & leasing; information; arts, entertainment & recreation; utilities; finance & insurance; and wholesale trade. New Orders Index (59% in March, from 65.2% in February). And one showed accelerating growth. Employment Index (55.9% in March, from 55.2% in February). Of the 18 individual sectors that the ISM index covers, 16 showed growth in March, and two contracted (educational services and retail trade). The rise in new orders was attributed to greater demand from new and existing clients. Although the pace of growth was slightly below the series trend, it was one of the strongest seen over the last five months. Meanwhile, new export business increased for the second month running, often linked to the acquisition of new clients. So it’s this kind of scenario where not everything is hunky-dory, but overall activity is on track for solid growth, with real strengths in some areas and weak spots in a few others. If service activities weaken, as they did in 2016, the Fed will get nervous about the economy. But if service activities stay in the range where they are currently, the Fed may feel emboldened. Even the doves on the FOMC have expressed their belief that with this economy, the time is not right for a rate cut. And others, given this economy, have put a rate hike on the table. And the services sector will be key as the plot develops. March 3rd 2009, the S&P 500 closes at 696.33 : Obama sees stocks as a good investment. Barack Obama. Best investor of the 21st Century. 10 years later and he nailed it. All is well. Thank you Wolf for a great report. If you didn’t know the Fed was going to print $3T of money and embark on a massive wealth effect experiment, you simply got lucky by holding stocks. I’d put Obama’s remarks in that category. You can say that again. That changed the playing field forever. And who would have known to what extremes they would take it? Free markets and price discovery are gone….. There can be very few people left who truly understand what in today’s world those two words really mean. Never been any such thing as ‘free markets’ – how much US ‘economic prosperity’ would there be for instance without $900+ billion tax-funded ‘defense’ (ie attack) spending per annum? Corporations have always been state funded in the form of loans and grants. The only ‘free market’ experiment was the fall of communism 30 years ago – the ultimate libertarian experiment. That played out with the rule of the thug who appropriated everything via violence ,and made sure everyone else was to stay poor. Looks to me like a massive asset bubble getting more dangerous year after year amidst widespread complacency remainescent of the 1920s—except worse in terms of the ultimate crash! This worldwide flood of money printing has destroyed rational risk taking via zero based interest rates and will ultimately result in a devastating world depression! Out of control government spending is another ignored part of a bleak economic future. Yes Obama, best investor of the 21 st Century – along with tens of millions of others. People at the office I worked at the time were openly talking amongst ourselves which stocks they were buying near that bottom. I recall GE being a favorite at the time. Obama, a giving common sensical investor advice like tens of millions of others. Politicians are usually perma-bulls, I’ve never heard one downgrading the market to a sell rating. Tongue and cheek it was often said at the time that pres. Bush was the best investor because he had the US DOE buy back all of it’s strategic oil reserves years before the 2008 spike. The swing in oil from 2008 to 2009 was quite a sight. Back of envelope calculation and every citizen of US has invested 50k in SP500 since 2009 for a 2% dividend ? I’m not sure services are going to give much warning, mid 2007 they were at this level also. ..or maybe one person bought one share at five times previous value so quintupling market cap, and when they goes to sell it they won’t get but a fifth of what they paid ? How much is the market really worth, just what the last buyer put into it ? What people believe it is worth ? I guess if the market is delusional then it is going to need lower rates, or is it deluded to think they will be supplied ? Guess The Committee 2537.47.5 is out soon so that will be different, just like last time. “just like last time” . At some point in the future it won’t be ‘just like last time’. I suspect a new precedent will be set. Western government debt to gdp is so high now, and gdp is so inflated by superfluous activity that cannot provide real returns and that I think eventually will have to deflate in a time of stress, that the prospect of raising rates will either become known as impossible so leading to a style of Frankfurt school economic management that is openly state controlled; or high inflation will result and rates will be raised at the expense of all else to keep the currency; or rates will be raised on purpose “early” in a sort of controlled demolition, possibly with a share of existing government debt being monetised into the bargain to reduce its share in a shrinking gdp. More exotic even would be to move to an international currency via sdr for example, but I don’t think the US would accept a globalist governance (yet) even if it partly exercises that to a degree itself now. Also possible is for currency to become a devolved affair in a supervised (order of law) but deregulated world. It is all a guess though, and also depends on the timeframe – are we looking five years into the future or fifty. I think the future will be different from what we are able to imagine, so I tend to place the more timeless concepts (how people are towards each other for example) first, and economics and money and management second. I don’t think it is right to give too much power to outside influence, instead it is more important that people are right with themselves. April 2009 “mark to market” is suspended; the “market” saw that, began to rise immediately and has not looked back……matter of record. As the few people that are aware of the real situation we are always complaining about the Fed interventions and what it is doing to the markets. It is frustrating to no end to always be seen as the pessimist because I know how things are actually working – that negative rates are stupid and that the only reason that stocks are up is buybacks and intervention. Most people have no clue and just think “oh, those finance people figure it out”. So I want to ask if anyone has any idea on how to push the more common sense narrative out into the mainstream media? I’m just so tired of not being able to invest at reasonable levels with any confidence and having this bs Fed and ECB that constantly says “things are good” ….. but we need to spend trillions in QE like we are in the depths of recession. People need to realize that either everything is a house of cards and we need stimulus but stocks don’t deserve to be where they are …. or if they are so good we can stop spending trillions on propping the markets up and suffer a healthy rate adjustment. Can’t have it both ways and people should be tired of this boom bust every ten years. It would just be so much better in every way to have a slow, steady….but real growth rate with solid savings rates and businesses that deserve to exist at say 4-7% rates….but how do we get the real narrative out there because the general public doesn’t get the message and the Fed and media don’t put it out because they aren’t incentivized or forced to. Tons of debt, both public and private to get feeble GDP(realistically probably lower) growth around the globe, what could possibly go wrong. What’s next to push that string along. So, the 10 or so years following the 2008 financial crisis wasn’t a zero interest rate or QE economy. You could say it was delusional to suggest it was. Yet the Fed did both for 10 or do years. Seems to me until proven otherwise the market is behaving rationally in expecting the Fed to use the same tools it’s used for the past 10, 20 years. Give me an unlimited credit card that allows me to pass the bulk of my debt to the next generations and I will impress you with my economic growth. All jokes aside, how much of this growth is attributable to years of easy credit? Have we used that debt to increase our productivity? Or have we squandered it buying grossly overpriced assets? US GDP grew by $1T in 2018. National debt grew by around $1.3T or more. Add in corporate and personal debt growth, plus growth in unfunded liabilities, and it’s clear debt is fueling everything. How many future retirees would be buying those $50k trucks if they knew SS and Medicare cuts were straight ahead. But there’s more. Take out consumer spending attributable to one time wealth effects and interest rate reductions, then how much “growth” do you have? People forget that it’s the reduction in rates that provide the stimulus. You need continuous reductions, not just a consistent low rate. Each rate reduction sets off a new round of investment and speculation that eventually subsides. Not looking good given the economy has sputtered with rates at only 2%, and zero structural remedies have been implemented. If they reduce rates back to zero it would buy a little time, but after that Daddy comes home. Old Dog-an excellent observation. I have often felt that the general flat-lining/decrease in real U.S. wages since 1980 was effectively masked by the following explosion in the unlimited/easy credit made available to the working population in place of any true wage gains. Two, six, ten, more? pieces of plastic requiring only minimum monthly interest let so many live in perceived comfort, especially when the stagflation of the late ’70’s/’80’s destroyed any incentive to save. (How many families facing this at the time wound up teaching their children a new financial paradigm? i.e. : saving is for suckers, and you can ALWAYS get a new card with an ‘affordable’ minimum payments to conduct a comfortable lifestyle. No need to organize and do the hard work of making sure you are properly compensated for your labor, or realistically allocating the financial resources you do have…not hard to see that it was/is so easy to sell the opiate of easy credit to the many). Of course, the party can’t go on forever, it just amazes me how much wealth our country had to blow, and how long it took to blow it…). Rant over. May we all find a better day. Wolf this was a wonderful piece. The (equity) market is unfortunately calling the shots these days when it comes to the Fed. It seems like the Administration is asking for yet even more of the market than its mere 20% recovery over the last few months. The Administration also wants 4% real growth. The attacks on the Fed will unfortunately only intensify as we go into 2020 elections, as the president has (unfortunately) pinned his performance to the equity market. This isn’t right, or good or moral…..it’s simply the unfortunate reality. In December we had another wake up call on who is really calling the shots. We simply don’t have enough checks and balances between the Fed and the Administration…….and the greed is horribly insatiable. Strangely enough, Minnesota Fed President Neel Kashkari, the most permissive and promiscuous low-interest-rate advocate ever, agrees that the FFR should NOT be cut, or at least not right now. Amazing. My head is about to explode from the incongruence of it all. No surprise. The market is climbing 5% a month. Why would Neel or anyone else want a cut at this point in time ? You can ask any Fed official yourself. He/she will tell you everything is fine right now. It is not as if a major bank is about to collapse. Neel can start jawboning rates down if the Dow comes in 5% or so..
Their thinking has evolved, QE will soon be a policy tool, not an emergency measure. Powell got out ahead of weak data curtailing rate hikes, and Kudlow’s own preference is to keep a foot on the gas until the car stops. You raise rates to keep the rally going. Why wait for the crisis, stimulate now! You owe the bank $100, it’s your problem but owe them $100M it’s their problem! The US household Debt/GDP ratio came down quite a bit over the last 10 years even as asset prices climbed substantially. Canadian, Australian and Korean citizens would love to have low household debts to income like good old clean dirty shirt USA . I am not sure if we should give Ben, Janet and Jay all the credit for the prudent management of our household finances over the last decade but these finances do look like they are now in better shape than they have been in a long while…relative to GDP of course. Well, this Canuck hasn’t had any debt, (personal, mortgage or consumer debt) from age 45, onwards. My friends do not have debt. I retired at 57 and my wife at 55 because we have lived prudently and live a modest lifestyle. My kids, ages 35 and 39 own their own homes and will have them paid for by age 45. Don’t let the Vancouver and Toronto stats cloud your opinion about the rest of our country. An above commentor just mentioned his medical bills. This past month I had to drive my tenant and friend to hospital emerg 3 times with heart problems. (He, age 79 and out of shape). He also had a nine day hospital stay, a transfer to a heart specialty ward in Victoria, several ct scans, an angio, and a re-admittance due to a reaction to blood thinners. He has since been released and is now under care/supervision of an internal specialist (local heart doc in nearby town). He will also be enrolled in a ‘heart health’ exercise program, and I encourage him to walk, daily. His cost? None. Not having medical bills in late retirement and later on in life is a gift impossible to estimate. My 68 year old US sister has to buy supplemental insurance because medicare doesn’t cover enough if something serious were to occur. Canada is a pretty clean shirt. Yes, some people borrowed too much to buy housing bubble cribs and autos. However, overall, it is a great place to live. Or one could say “their words not mine”. So at least we know JPM won’t go belly-up, the FED will make good on their bet (The liability gets passed onto someone else). That’s the plan all right. Ah but it IS a ‘rate cut economy’ when these services are bought with credit, not savings. It’s ALWAYS a rate cut economy when the prosperity is illusory/delusional. There’s no other way to perpetrate the illusion…apart from paying people more. And apparently, we don’t do that because it causes inflation – although arming minimum wage workers with five credit cards apparently doesn’t. Obviously there’s some strange effect whereby spending borrowed money doesn’t cause inflation, whereas spending earned money does…strange. My guess is bears are gunning for rate hikes. I agree with them this is unlikely to end well, judging by past evidence. IMO, someone will be stuck bigly, holding the bag of an upside down pyramid all thanks to flawed models of central bank planning (I also believe they know what they’re doing and paid well to do it). It’s not a rate-cut economy…yet. But it will be. Fed officials were happy to make a Devil’s bargain with QE, and then they piled on to the policy error in grand fashion. Other global central banks jumped on the bandwagon as well. Here we are a decade later, with the economy and the housing market more addicted to super cheap credit than ever before as the debt just keeps piling up. At each turn, as the Fed attempts to jawbone markets higher, fanning the flames of asset inflation in spectacular bubbles, the trickle-down monetary experiment becomes increasingly exposed as the fraud that it is. This will not end well. It never does. What we are experiencing now is a temporary reprieve in a much larger storm. To me the Fed should keep to the dual mandate, maximize employment and preserve stable prices. Employment by U6 is not bad historically https://fred.stlouisfed.org/series/U6RATE, don’t want to get into a LFPR debate with all the demographic issues. There are plenty of other articles for that. Core CPI is 2.1 Y/Y and Core PCE is at 1.8 Y/Y. That does not sound like it needs a rate cut. CPI is should come out the 10th I believe. It will be interesting to see if the well deserved increases in AHE has started to push the rate higher. Anecdotally I have seen prices sneaking up in the beer aisle. Beer sales have been slumping, which is sorta surprising when you consider what the beer aisle looks like now vs. a decade ago. We will see how much pricing power they have. Wonder is MJ sales is a factor in states where rec mj is legal? Now that sounds like a great blog post. Will MJ kill beer sales? Wolf readers want to know. No, although some brewers are infusing their product. Rec MJ has been a bust in CA, the state passed it but local governments ban the sale. The state had to issue a directive allowing buyers of Rec MJ to accept delivery, and or carry the product home and use it without local interference. On top of that prices are falling. Growers are leaving the business. Prices are dropping. The state does want to lower the legal BA to 05, which is similar to DOT limits. If that happens and a gram costs less than a 12 pack of craft beer MJ use will grow. I love a good brew. And I have zero interest in ever again consuming MJ in any form. That’s a problem for the MJ market. I don’t think that people who like beer would switch to MJ because it’s now legal or cheaper – it’s just not the same thing. One doesn’t substitute for the other. That said, beer sales (in volume) on a per-capita basis have been falling for three decades. About 10 years ago or so, beer sales began falling faster than population growth, and total beer sales began falling. The surging craft brewers were able to pile in and get some share of the market, and their sales were soaring even as Big-Beer sales were sinking. So Big Beer started buying the craft brewers, and now, craft brew sales are also falling. Go figure. Wine and to a lesser extent hard liquor along with generally reduced alcohol consumption killed beer. I go to dinner parties where there isn’t even any beer offered. Just wine. A good IPA goes wonderfully with steak, but no. Can’t get it. Gotta drink wine before, with, and after a steak. It won’t outright kill beer sales, but it could definitely make a dent in them. For some people it is a much better substitute than alcohol, particularly during the work week, and I think more people will figure this out as time goes on. It’s not the same thing but it is used similarly and so they will be connected, but of course only to a point. This all depends on the federal government though, so it will probably take much longer than it should. There are some powerful parties on the against side that will probably move over to the other side once they can develop uses and lobby for more exclusive rights. This is all just speculation though. Maybe not a typo but it’s nuts. GAAP doesn’t apply to governments. If GAAP applied, everything that is public, including all federal lands in the US, all federal buildings, highways, bridges, river locks, canals, ports, and other infrastructure, every federally owned utility (such as TVA), every fighter jet and aircraft carrier, every property the federal government owns in the US and overseas, above and below ground, including minerals and hydrocarbons, would be assets on the government’s balance sheet, and those assets would have so much value that it would blow out your eardrums. People who selectively connect GAAP to government accounting have no clue about GAAP and how it would balloon the assets on the balance sheet. So better not to post this BS on a finance site such as this. My point was the federal government is not saving to pay for future obligations (nor reforming its wild spending). Will the gov sell all that to pay ballooning obligations or inflate away the cost??? Yes, this is a quagmire. Pension and healthcare obligations are a “flow” not a fixed “inventory” because not everyone is going to retire at the same moment. As one retires and draws on the kitty, another one enters the workforce and pays into the kitty. So this is a constant flux that will never end, with money coming in and going out for all times. The hard part is making sure that the flows are in balance long-term. “Unfunded liabilities” is a measure of this as if it were an “inventory,” not a “flow.” So it’s not the best measure. But it is cited a lot. But I agree that there are some big issues that need to be addressed. You are falling into th trap of the money illusion. What matters is productive resources, not money. Money only rules how the resources are allocated. A huge fraction of the resources of our nation are being allocated to make life incredibly comfortable for the wealthy. A less lopsided allocation would be quite sufficient to provide the provision of goods and services needed to support the retiree living standards promised by the supposedly unsupportable Social Security and pension system ‘debts’. US Jobless claims at 50 year low. People on the sidelines have been re-entering the workforce and raises/wages have been kicked up quite a bit to retain and attract talent. Hard to imagine a better scenario for the average worker, but this will make the FED nervous. No rate cut in 2019. FED much more likely to return to their normal playbook and raise right into a recession in 2020. Also, the US dolllar has become stronger and stronger vs a bunch of foreign currencies, that’s another reason to not make rate cuts this year. People has been screaming for rate cuts since the FED started to raise rates, that does not mean the FED will listen. For a rate cut to happen US rconomy would have to have taken a huge hit and show no signs of recovery in the following months. Growth in the service economy is associated with a mature economy, any idea where service sector growth should be? Trump grabed Powell by his balls so, yes, there will a rate cut this year, no matter how ‘strong’ the economy is (not for everyone). The Fed’s decision will be justifiable by the low official CPI data. Hardly the real street inflation will matter for the Fed’s decisions. Corporates need lower tax rates so they can refinance their huge amount of debt, otherwise it would be game over. But, while dollar is the main reserve currency, EUA has nothing to worry about. My current thinking is that Social Security (SS) originated as a mandatory-retirement-savings, for all U.S. workers, type of plan. Given the past decade of VLIRPs and virtually-Z IRPs, it is the appropriate time for government and politicians to stop talking about entitlement, and pretending that SS is a welfare program; and stop trying to turn it into a welfare program. Much of the U.S. middle class has been whipsawed by the stock market crash, followed by close-to-zero percent earnings on their savings (those who sold close to the market bottom, and watched their cash earn zero in savings accounts, especially hard hit). It’s time, politicians, to stop proposing redistribution of middle class prosperity, and to start talking the guarantee of our existing mandatory retirement plans- Social Security. As far as healthcare goes, the focus for more than a decade has been on insurance, and quibbling over how much high-tech medical “care” your insurance should provide you….after you pay your yearly deductible, of course. That said, I must now close and take my walk- I know for a certainty that my only access to good health is my daily discipline.